Nick Kyrgios, Bernard Tomic and Jarmila Gajdosova have all been bounced out on a bad day for the Australian tilt in Rome. A day after Samantha Stosur was ousted by Anastasia Pavlyuchenkova; Kyrgios fell to Spanish veteran Feliciano Lopez, Tomic was knocked out by Victor Troicki and world number three Maria Sharapova was too much for Gajdosova. Kyrgios could not match his wily left-handed Spaniard opponent, who ousted the Canberran 6-4, 7-6 (7-5). While Kyrgios, ranked 30th in the world, was the bookies’ favourite to win the match, Lopez is world number 13 and 11th seed in Rome. 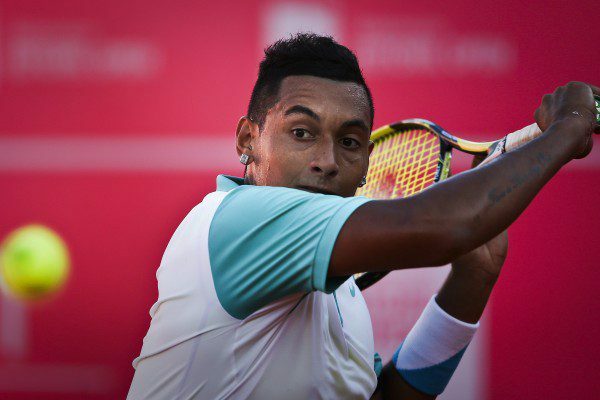 Kyrgios had enjoyed a stellar few weeks by reaching the final in Portugal and then beating world number one Roger Federer in Madrid before going down to John Isner in three tough sets. Tomic, still Australia’s highest-ranked male at 27th, served five double faults and saw 12 aces fly past his racket as Croat Troicki pulled out a brutal 7-6 (7-3), 6-7 (4-7), 7-6 (7-4) victory. Defending champion Novak Djokovic scraped over his first hurdle with a 6-1, 6-7 (5-7), 6-3 victory over Spanish claycourt specialist Nicolas Almagro. The world number one, given a bye into the second round, was in total control as he swept through the opening set, but the aggressive Almagro settled down to his task and made the Serb work hard for an 18th consecutive Tour victory. Djokovic looked poised for victory when he built a 5-2 lead in the tiebreak but Almagro fought back and, when Djokovic netted a tame forehand at 5-5, Almagro seized his chance, clinching the second set with a powerful first serve. Almagro, who missed the second half of last year after foot surgery and has slipped to 174th in the rankings, continued to worry Djokovic with his power at the start of the third set. But Djokovic kept his nose in front on serve and broke in the eighth game after winning a long baseline exchange. The three-time Rome champion completed the job on his second match point when Almagro fired a backhand long. Former Australian Open champion Stan Wawrinka also reached the third round but was also stretched before overcoming Argentina’s Juan Monaco 4-6, 6-3, 6-2. Ninth seed Marin Cilic was the highest-ranked casualty, losing in straight sets to Guillermo Garcia-Lopez 6-4, 6-3.